Glaciers, pristine lakes, fjords and wild forests, this is the stuff of dreams. Over 18 spectacular days, you’ll explore the very best this region has to offer. Wind your way across western Canada, visiting highlights such as Banff National Park, Lake Louise and the outdoor playground that is Jasper National Park. 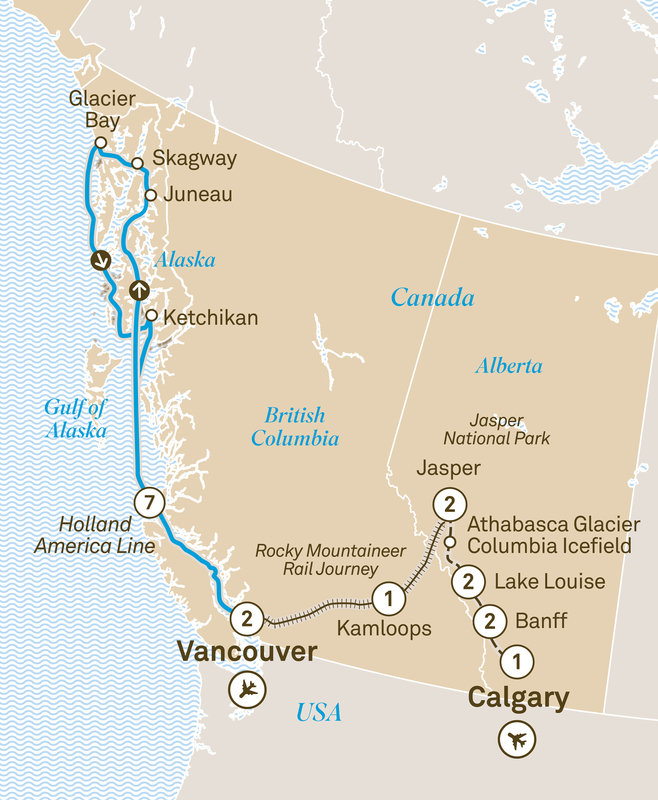 Then board the Rocky Mountaineer for two days of extraordinary vistas. The cosmopolitan wonders of Vancouver are yours to explore, before you delve deep into the wonders of Alaska on a seven night cruise. Visit Juneau, accessible only via air or sea, and stroll around Skagway, a historic gold rush town. Glacier Bay National Park has got to be seen to be believed and Ketchikan is a paradise if you’re a fan of salmon. Let yourself be charmed by the many natural and cultural wonders that can be found across this journey. Welcome to Canada. Your adventure begins with an overnight stay at the Fairmont Palliser. Celebrate the start of your journey with a welcome dinner. See Canada’s history re-enacted in the Heritage Park Historical Village. Arrive in Banff, where you’ll feel like royalty in your mountain or valley view room during a two night Special Stay at the Fairmont Banff Springs. Tonight you’ll be treated to an exclusive ‘Rocky Mountain Round Up’ evening of entertainment, fabulous food and western hospitality. Ride the Banff Gondola for magnificent views or take a helicopter flight. Alternatively, enjoy a Bow River float trip, take a guided nature hike, play nine holes of golf or take a relaxing soak in the mineral pools. You can also head into the mountains by wagon for a cowboy cookout lunch. In July, you can also opt for a day trip to the famous Calgary Stampede. Enjoy dinner at your choice of restaurant at your hotel. Pass mesmerising lakes and towering mountains en route to Lake Louise. For the next two nights, you’ll enjoy a Special Stay in a stunning lakeview room at Fairmont Chateau Lake Louise. Tonight, choose between fine or more casual dining. Meet a Canadian Mountie wearing the famous red serge. This is a rare opportunity, be sure to take a photo. Take an ‘Ice Explorer’ on the mighty Athabasca Glacier, and perhaps even indulge your inner child with a snowball fight. Later, check in for a two night stay at the rustic Fairmont Jasper Park Lodge. Tonight, choose from a selection of restaurants at your hotel. Cruise on a Harley Davidson™ sidecar or, if you prefer an aquatic adventure, go boating on Maligne Lake or raft down the Athabasca River. Alternatively, ride the Jasper SkyTram or explore Maligne Canyon and Jasper’s lakes. Enjoy GoldLeaf Service on the legendary Rocky Mountaineer. Relish the glass dome windows as majestic Mount Robson towers above you, and charming Moose Lake glistens alongside you. Stay overnight at a Kamloops hotel as assigned by Rocky Mountaineer. Reboard the Rocky Mountaineer for another day of fantastic views, delectable delights and 5-star service. Arrive at Fairmont Hotel Vancouver, a city landmark, exclusive to Scenic and your home for the next two nights. Capilano Suspension Bridge Park opens early, exclusively for Scenic, so you can enjoy a tranquil stroll before the crowds arrive. Explore the sights, tastes and sounds of Vancouver during a city sightseeing tour. Join your Cruise Director for your luxurious seven night Alaskan voyage on board Holland America Line’s ms Volendam. Keep an eye out for orcas, humpback whales or bald eagles from your verandah stateroom. For the duration of your cruise, the ‘Signature Beverage Package’ has been included. Celebrate your first day at sea with a festive lunch. Continue to Juneau, Alaska’s state capital only accessible by air or sea. typify Skagway, the gateway of the Klondike. Marvel at the icy drama of Glacier Bay National Park with a steaming cup of soup or hot chocolate in hand. A National Park Service Ranger will interpret the natural wonders and wildlife. Alaska’s last port of call is known as the ‘salmon capital of the world’. Today, just enjoy your elegant cruise southwards. Celebrate the end of a wonderful Canadian & Alaskan adventure at your farewell reception. You’ll arrive in Vancouver today for your onward or homeward bound journey. If your international flight departs after 5pm, take advantage of our hospitality lounge at the Fairmont Hotel Vancouver. From Victoria to Vancouver, visit the breathtaking Butchart Gardens, soar above Whistler on a helicopter flight and stay at the luxurious Fairmont Hotels.